Timothee Chalamet caught my eye when he hit the red carpet on Saturday(October 13th) for the premiere of his new film 'Beautiful Boy' & the Headline gala during the 62nd BFI London Film Festival in London, England. 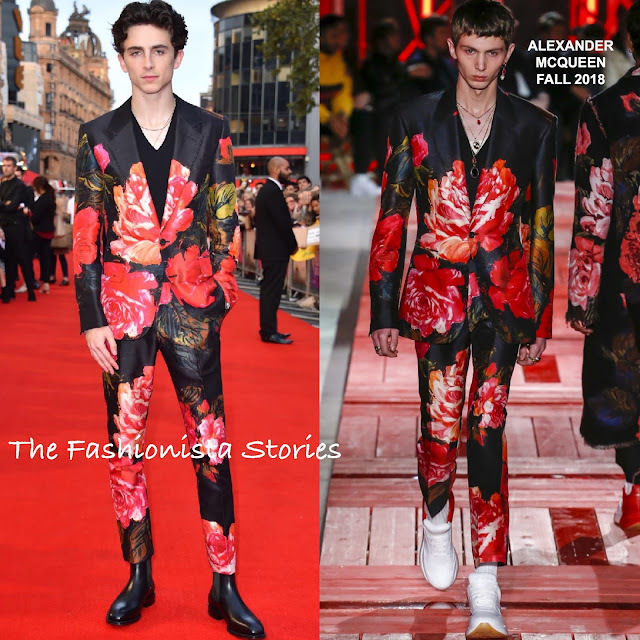 The young actor stood out perfectly in a ALEXANDER MCQUEEN FALL 2018 black painted floral single-breasted, drop shoulder suit, with a black t-shirt underneath. On the runway, the suit was paired with white sneakers which gave it a sporty feel. However Timothee rocked black shiny Chelsea boots which gave it a cool, edgy finish. Are you loving Timothee's look as well?